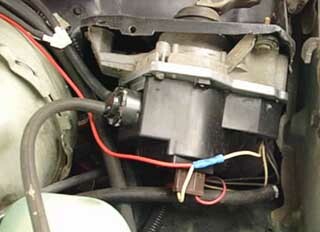 Hooking up the electric choke on an Edelbrock AFB carb. When I first installed the Edelbrock 1406 carb with electric choke I had problems with running way too rich, not opening the secondaries and the choke staying on way too long. After I ran out of ideas and the installation manual wasn't much help, I finally broke down and did the thing we all hate to do: Call support. They told me that this was a common problem with GM installations because the stock choke wire does not provide a full 12 volts to the choke coil. This may be fine for Quadrajet or Dualjet carbs, but the Edelbrock will not function correctly unless it has 12 volts supplied to it. They suggested splicing a wire from the windshield wiper supply wire and running it to the choke. This will work for the connector pictured below, but other types of connectors might be more difficult to tap into. In such cases, it might be a better idea to run a wire from the IGN circuit at the fuse block. The white wire is the wiper supply line and the red one is the wire I spliced into it. Then I connected the other end of the wire to the "Plus" terminal on the choke assembly. This eliminated all the problems I had been having with the choke. 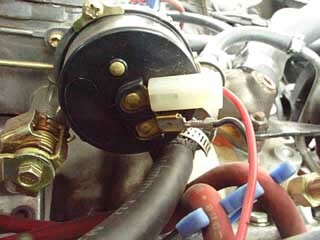 I even had a 4-barrel carb, since the secondaries started opening up.